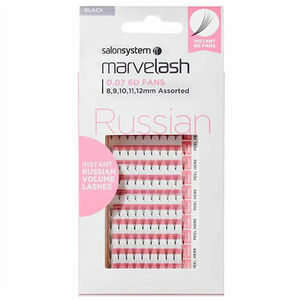 Terrific pre-made base lash for ultimate layering and feathering effects. 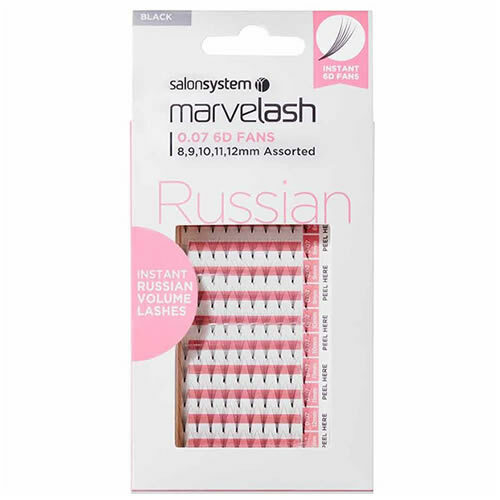 Salon System's Marvel-Lash 6D 0.07 Russian Fan Black lash extensions are an ultra-quick, easy route to superb lash volume for your clients. They can be used as a stand-alone lash extension or used with a selection of 0.05 and 0.07 for unlimited layering and feathering effects! The pack contains assorted lengths (8, 9, 10, 11 and 12 mm) made from black, synthetic hair. They're quick and easy to apply thanks to their adhesive peel-off strips. £16.74 (inc. VAT) Why no VAT? We're a trade wholesaler and quote our prices without VAT to help our VAT-registered customers understand the true cost of a purchase. Stainless steel angled tweezer specially designed for layering and feathering with Russian lashes.